It’s imperative for no-tillers looking to graze cover crops to think about individual goals and resources, soil types and other variables when choosing what species to plant, says Jim Johnson. What worked for one grower may not for someone 300 miles away, says the soils and crops consultant for the Samuel R. Noble Foundation. Understanding livestock and soil health goals, crop rotation and soil types can help no-tillers make cover grazing a more profitable venture. Cover crop grazing isn’t one-size-fits-all, particularly in a dryland no-tilling situation, and it’s not something to be entered into without study. But with some thorough planning and on-farm testing to find multi-species mixes suited to local climates and soils, mixed cover crops can do double duty, says Jim Johnson. The soils and crops consultant for the Samuel R. Noble Foundation says it’s been widely shown that cover crop grazing offers benefits including improved soil biology and increased soil life, higher soil organic matter, better soil structure and fertility, increased water infiltration and moisture-holding capacity of the soil, and increased production through seasonally available forage. Well-managed cover mixes can decrease weed problems and provide a higher quantity of forage for livestock. Frequently, forage quality improves over long periods of time. Grazing cover crops is a way to turn them from an expense into a profit center, Johnson says. In addition, properly executed grazing on top of cover cropping will speed up the rate of soil health improvement. For example, Leedey, Okla., no-tiller Jimmy Emmons and Waverly, Kan., no-tiller Darin Williams have reported typical cattle gains of 2-2½ pounds per day in the summer from grazing multi-species cover crops that both build soils and serve as grazing fodder. But such results won’t come to pass if planting and grazing management doesn’t follow principles of soil health. Johnson says producers contemplating grazing a cover crop must think about why they want to pursue the practice. “Do you want to add livestock to your system, or do you already have livestock and need feed for them? Do you need to add diversity? Just about every cover crop that I put in is going to be grazed because I’m thinking about the benefits that livestock bring to the ecological system,” Johnson says. Cover crop grazing opportunity varies widely, Johnson points out, dependent on climate, crop rotations, when and how covers are planted, and the intervals between cash crops when grazing covers could be used. Changing farm policy is opening the door to more cover grazing, since insurance and other programs no longer consider covers a crop. That policy change allows producers to begin using covers when they couldn’t before. Herbicides used in prior farming may be among foremost challenges in getting started. “Think about what previous herbicide is out there, what is its lifetime, what is it going to do to things that I might be looking at putting into a cover crop — particularly if I’m looking at a diverse mix, and what are grazing restrictions?” he says. Whether it’s a box drill, air drill, broadcast spreader or planter, no-tillers seeking to graze livestock on cover crops have important equipment decisions to make — not only to seed covers but also to work through the residue when planting cash crops, Johnson says. 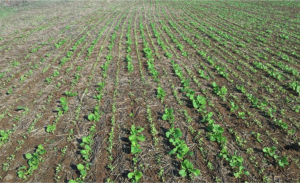 Above, an air drill was used to seed clover and canola in alternating rows. 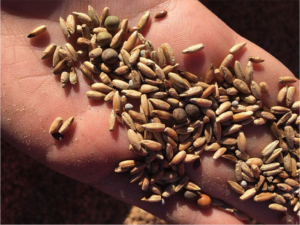 Many critics say utilizing cover crop mixes in semi-arid climates for soil improvement or even for grazing will use up water needed for a future cash crop. Johnson acknowledges that in southern Oklahoma and the High and Rolling Plains of Texas there is less rain than most of the Midwest and more evaporation. “The difference between rainfall and evaporation is key — we have 100 inches of evaporation and our deficit is much bigger to overcome,” he says. “We worry about water — it’s the most limiting factor in our part of the world. A cover crop is going to use up moisture. You’re not going to grow a cover crop on no moisture. But what we think we’ve seen is that when it does rain, you recharge that profile faster and deeper because you’ve got better soil structure and more pores. Weed control options in cover crops for grazing can be limited. Advance planning is crucial, and cover plantings must be managed as a crop to be successful. Johnson says bringing livestock into the cover crop picture involves numerous infrastructure needs. Water quantity and quality must be sufficient, and fencing is necessary to control animals. Johnson suggests that grazing management should be considered when planning fencing, along with what kind of fence to use and resources to be poured into it. “You’ve got to think how water supply and quality matches the cover crop and potentially, other feed supplementing livestock. You could be creating an issue for yourself if you don’t take the cover crops, the supplement, the water, and the quality of each of those into consideration,” says Johnson. When pondering the cover crop blend, the whole crop-carbon ratio and how the cover crop can balance the crop-carbon ratio should be weighed. 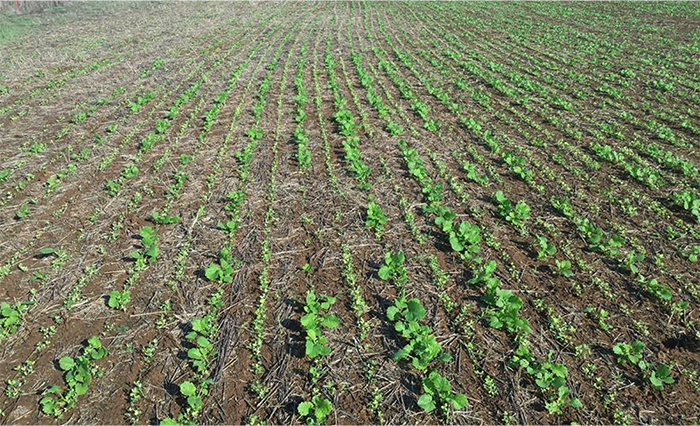 Growers new to seeding covers must consider if their equipment can handle planting into cash-crop residue, and planting a cash crop into cover residue. Deciding what to plant in a cover mix can impact overall success. Cover crops keep the soil protected from heat, cold and rain so that it stores moisture. Not everything in the cover mix should be considered livestock fodder, as some of the plants are there to feed the soil. “If we’re going to plant cover to graze, is it palatable? Flax is a great cover crop, but livestock won’t eat it,” Johnson notes. “Regardless of how good a cover crop species or variety is, if it’s not priced at an economical rate for your use, it doesn’t matter. Bloat and prussic acid can be risks with some cover crops, and brassicas can have high sulfur, and that becomes a factor depending on water quality. When choosing a mix, Johnson says, oats is palatable and suited to heavier soils, with rye well suited to light soils. Locally adapted beardless wheat varieties are available. Pearl millet likes sandy soil and brown-top millet is short season and broadly adapted. Spring and winter peas offer vigorous seedling growth, mung beans and cowpeas are suited to dry, hot climates and clovers offer specific niche benefits. “Okra is one of my new favorites,” Johnson says. “Cows love okra. They eat the whole plant to the ground, and if you have a little moisture in the soil it will come right back and the cattle graze it to the ground again. Johnson says getting the most from grazing cover crops ultimately comes down to individual goals, resources, species selection, what producers want to do and why, and management of all of the above.